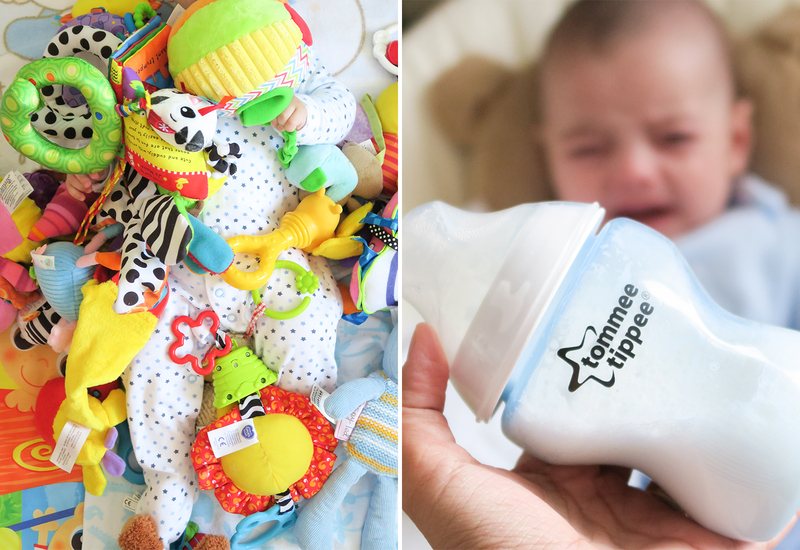 It’s no secret that babies thrive on routine; knowing what to expect next gives them a sense of security and it gives us parents something to hold on to for our own sanity during a chaotic day looking after a baby. I’ve been trying to get James into a routine since he was 3 months old, but after a lot of frustration and very unsuccessful attempts, I gave up and let him decide when he was ready for that. James is currently 5 months and 3 weeks old, and this is my schedule for him, which (touch wood!) seems to be working for us. The most important thing about our routine is to try to stick to the feeding and sleeping intervals rather than the actual times. That way, I’m not frustrating myself when we’re suddenly an hour behind schedule if unpredictable things happen, but I do try to stick to the timings as much as I can, give or take 30 minutes to 1 hour. So come along for a day in the life of baby James and I.
James’ daddy picks him up in his cot and brings him into bed with us. I then change his nappy and he has a little ‘talking session’ on the bed whilst I go downstairs to make up a bottle. After his bottle, he watches daddy getting ready for work, then we go downstairs. I put James down on the play mat or in his bouncer and play with him for a bit. He’s loving tummy time at the moment, so I put him straight down on his tummy and watch him roll onto his back, over and over again. At this point, I usually try to sneak in a coffee, but it’s rare when I get to drink it hot! When he starts to grizzle or yawn, I pick him up and rock him a bit whilst he watches whatever is on Baby TV. That gets him nice and quiet, so I take him up to his cot and give him a few cuddles before he finally drifts off. Then I literally run downstairs to get as much done as possible, as he rarely naps for longer than 45 minutes, so it’s my chance to get organised for the day! When James wakes, I change his nappy and we go down to the kitchen to heat up his breakfast. He is having an ice-cube of fruit puree – usually pear, apple, banana or papaya – and he absolutely loves it! We finish it off with an ounce of cooled boiled water, a quick wipe of all the mess before he has a meltdown, as he hates having his face wiped! Back to the living room to FaceTime his grandma all the way in Brazil for a chinwag! I try to call my mum every day so she gets to see him and feel a part of his routine, even though we’re so far apart. The boy does love his milk! We’re on 4 hourly feeds, so this is the second bottle of the morning, which he usually guzzles down. I put him on his bouncer and try to get some housework done, which isn’t always successful, so we end up on the playmat with me making all sorts of silly faces to amuse him. Then we get nice and cosy on the sofa, enjoying cuddles and tickles before I take him up for a nap. This nap doesn’t always happen on time and it can take me up to an hour to put him down successfully. I don’t give up, though, because I know he won’t function well without it, but I do whatever I can to get him to drift off, even if I need to give him a bit of a feed or let him sleep on my arms. 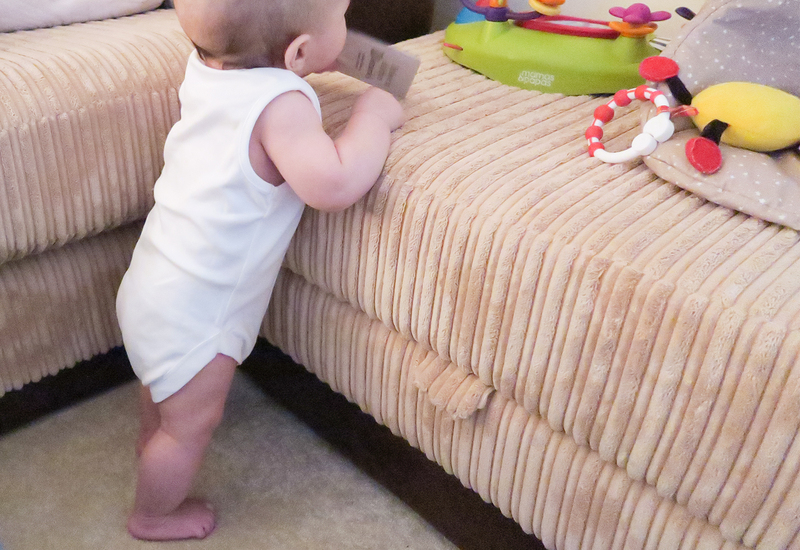 After a nappy change, we’re back downstairs for some more playing or, if the weather allows, we go out for fresh air and exercise, which we both enjoy. 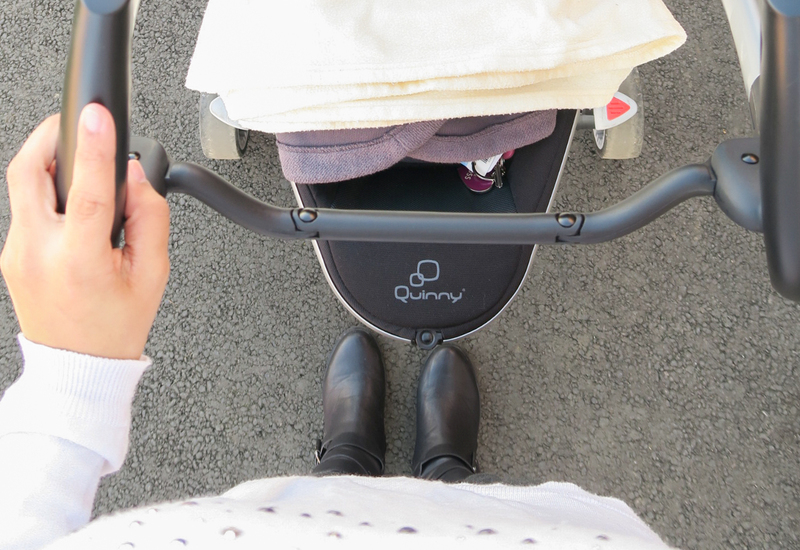 This is also the time I like to go out shopping with him, as I can pretty much always guarantee he will be happy for a couple of hours, either napping or having a bottle. For lunch, James has an ice-cube of vegetable; so far, we’ve done sweet potato, carrot, parsnip and butternut squash. He loves all of them, but carrot is his favourite. We watch some more Baby TV, whilst doing tummy time, sitting up time and lots of standing and kicking those legs about. 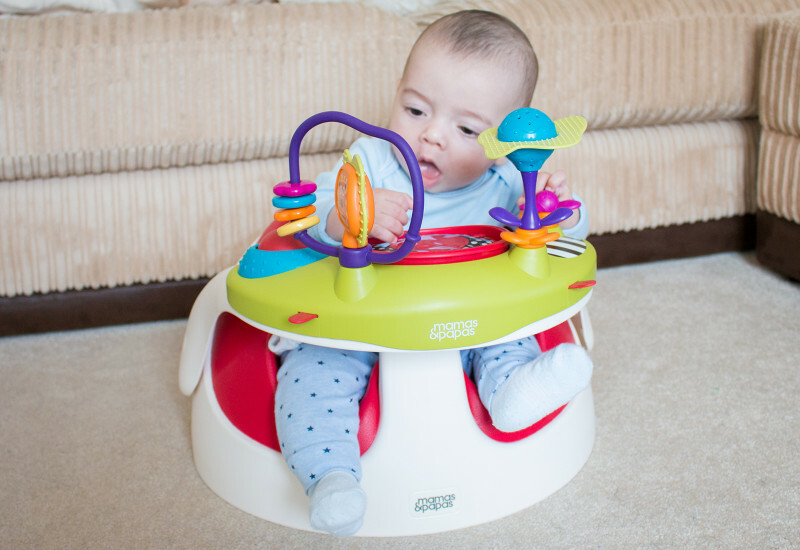 James is starting to enjoy his Mamas & Papas Baby Snug chair now that he fills up the seat a bit more. Even though we’re mostly bottle-feeding nowadays, I want to keep my supply by breastfeeding James a couple of times a day. I also enjoy the closeness of breastfeeding and James likes to cwtch up to mummy, especially now that the weather is getting a bit chilly. Because he’s a milk-monster, he still needs a bottle after breast, so I give him about 6oz top up. This is the ‘wishful thinking’ nap that rarely happens! When it does, life is good and the evening is easy. This is, in theory, the time I would get to edit any videos or blog posts, but it’s mostly spent rocking, putting down and picking up a screaming baby, shushing, some more rocking, cuddling… until it’s too late for a nap and we have to go back downstairs with an overtired grizzly baby, counting down the minutes for bath time. If the previous nap happened, this playtime is so much fun because James is rested and full of energy, so we roll around on the floor and call his other side of the family in Wales for a catch up and giggles. However, what usually happens is he misses his nap and gets so tired and grizzly, that he finds it hard to cope with anything but mummy’s arms. That’s what we call ‘past the point of no return’, and I’ve seen one too many of these for my liking! I choose James’ pyjamas, we head upstairs and I start running the bath whilst James sits in his bouncer. I make the most of this time whilst he’s distracted to get his nursery ready, dim the lights and turn on his lullabies. James loves his bath! He didn’t use to interact much with the water, but now he likes splashing and kicking his arms and legs in excitement when I’m washing him. 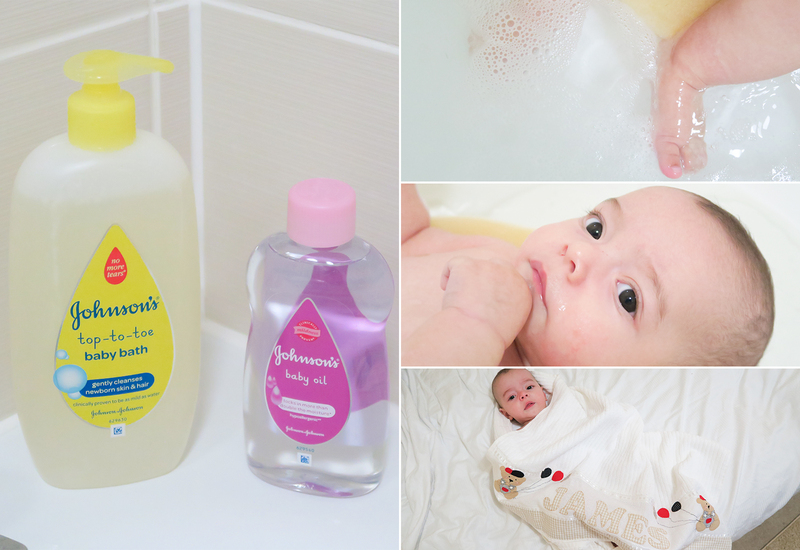 We received the Johnson’s Top-to-Toe Baby Bath to try, and I’ve been adding it to James’ bath every night for about a week. It’s quite reassuring to know that it is proven to be as safe and mild as water and it can be used for a newborn baby’s first bath. I found that it effectively cleans James’ body and hair, leaving him smelling so good that everybody asks me what I use on him. He also loves playing with the bubbles! 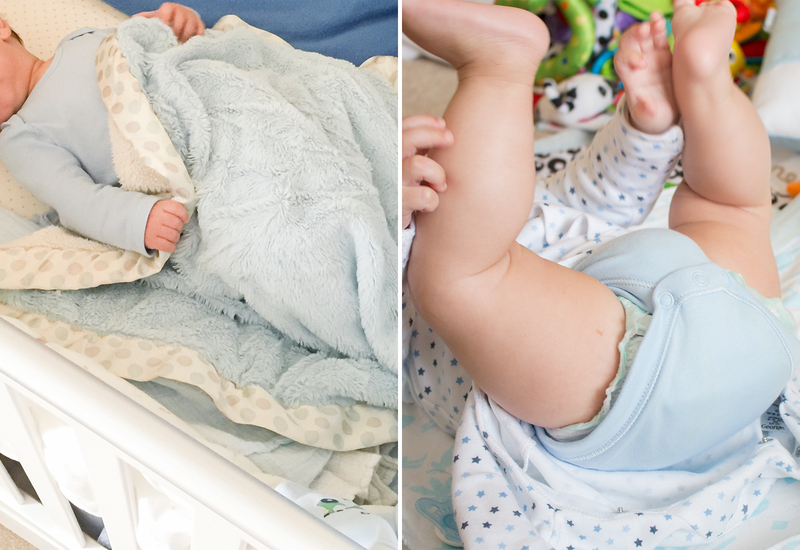 I wrap him up in a towel, pop him on the changing table and that’s when our winding-down ritual starts. 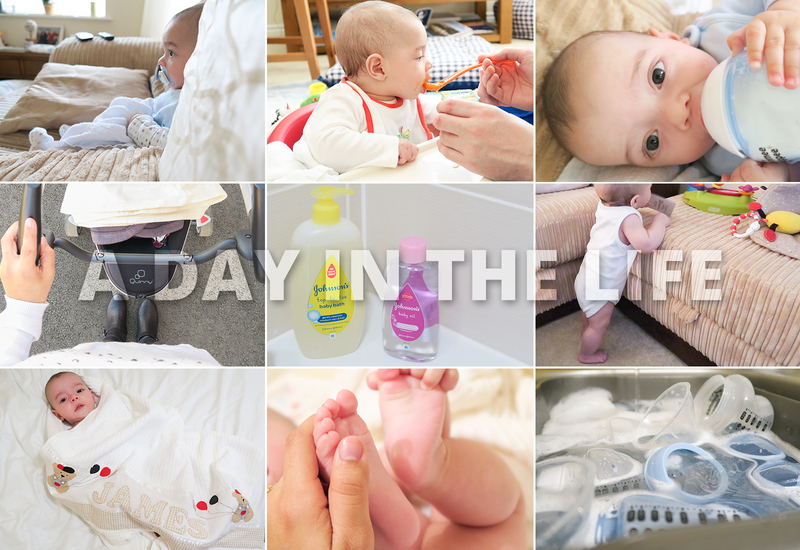 I use the Johnson’s Baby Oil to give James a massage, which is also suitable for newborn babies. James absolutely loves having a massage whilst I say a few prayers out loud to him. It calms him down so much, and using an oil has the added bonus of moisturising his skin to leave it feeling soft and more nourished than using a lotion. 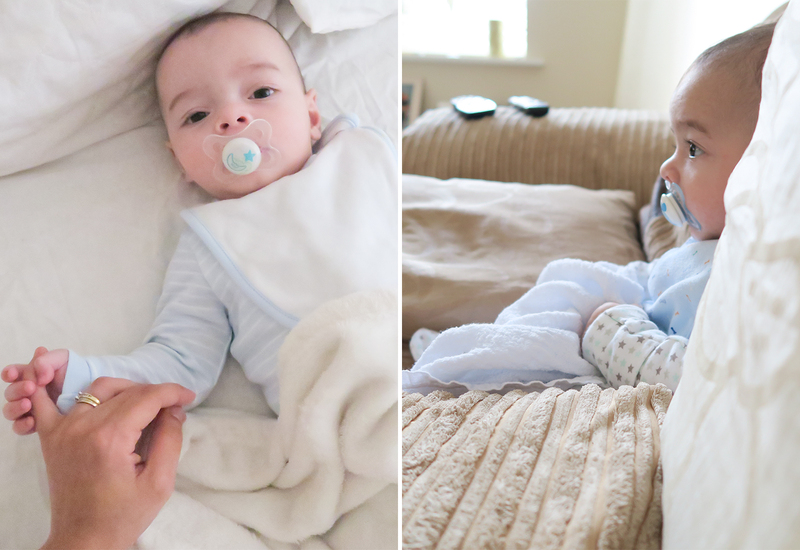 This part of our day has become such an important bonding moment for us, and I try to stimulate his senses as much as possible by touching, talking and giving James lots of cuddles and kisses. He’s a much happier baby after his massage, which makes it a lot easier to get him all dressed and ready for bed. 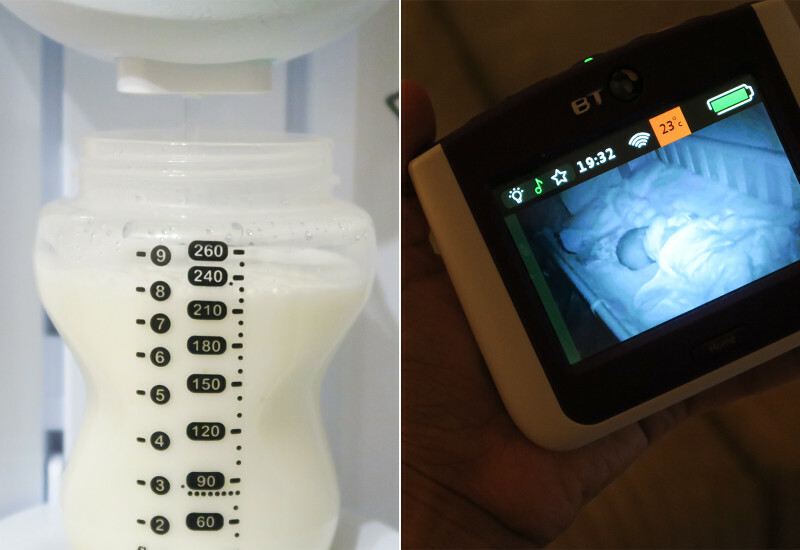 We start saying nighty-night to every single room of the house, turning all the lights off and we end up in the kitchen, where I get his bottle ready, shut the blinds and adjust the temperature of the house. When milk is ready, we say goodnight to the plants and by this point it’s very hard to keep him from grabbing the bottle out of my hands on our way back upstairs. I feed him in my room with the lights off or very dim and he usually falls asleep during or immediately after his bottle. I carry James to his room and gently put him down in his cot with a good-night kiss on his forehead, lullabies and a cosy blanket over his legs. It’s very rare that I manage to sneak out without startling him by stepping on a creaky floorboard, so I usually end up back next to him to give him his dummy and hold his hands until he falls asleep, and that’s him down for the night… at least on the good nights. 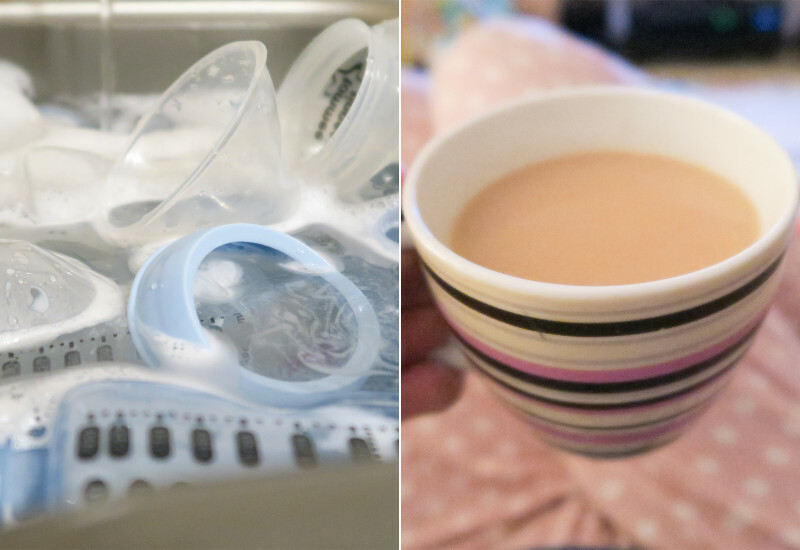 This is my time to sort the bombsite that is our living room after a full day with James, to wash and sterilise his bottles, tidy up the kitchen, defrost his food for the following day and finally sit down on the sofa with a cuppa to catch up on Instagram, Snapchat, YouTube, blogs and Netflix. When my husband gets home from work, we usually cook something together and cosy up to a movie or an episode of whatever series we’re into at the time. Then it’s bedtime for us, so we quietly march upstairs without waking the baby and the countdown begins for when James will wake next. I hope you enjoyed reading about what we get up to on a daily basis. My little James is my world and there is absolutely nothing I wouldn’t do for him, but boy does he keep me on my toes. I know it looks like we’ve done nothing all day long (and trust me, I often wonder where has the day gone), but I’m thoroughly exhausted by the time James in bed. 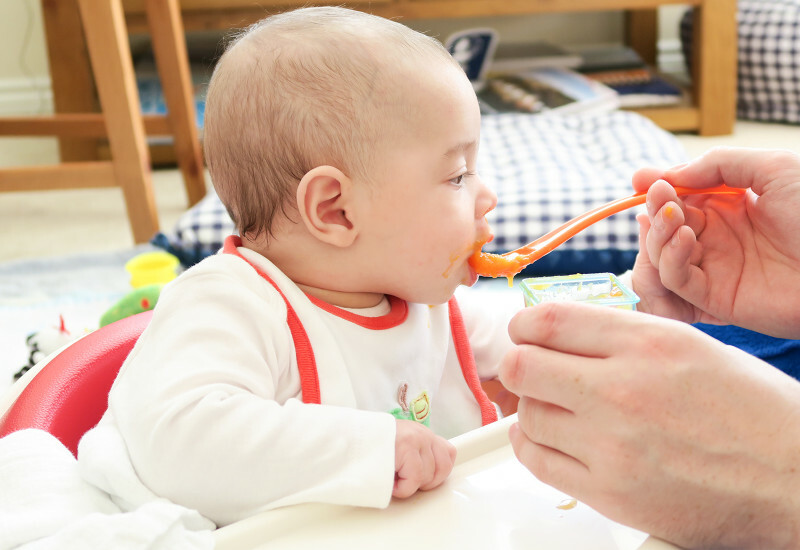 Looking after a baby is being constantly alert and on-the-go, with rare pauses to breathe, let alone, eat, shower or put feet up. Saying that, I’ve learnt to appreciate and take each day as it comes, because as challenging as being a mummy is, our babies grow up far too quickly and we will miss these moment when they are gone. Disclosure: Compensation was provided by JOHNSON’S® via Mode Media. Free product was provided by JOHNSON’S® brand for this sponsored post. The opinions expressed herein are those of the author and do not necessarily represent the opinions or positions of JOHNSON’S® brand.